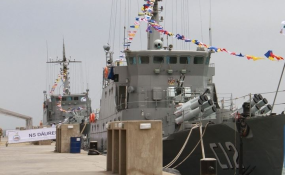 Two state-of-the-art Chinese-built naval vessels commissioned President Hage Geingob. Walvis Bay — The shuttle speeds past Hilton Hotel but Oiva Willbard's pensiveness turns into apprehension as he finds himself stuck in traffic around Windhoek High School. "It's lunch-hour, I am afraid you might miss the flight if these parents are this slow," says his chauffeur; stomach-churning words that compound Oiva's fears. He cannot miss this flight; China Harbour Engineering Company (Chec) has paid for everything, from his connecting flight into Johannesburg to another SA Airways to Hong Kong then Dragon Air to Nanjing. Even his shuttle to Nanjing University is aware of his itinerary, there is no room for error. On September 1, Oiva will become one of the two Namibians to study Marine Harbour Engineering. His classmate Martino Swarts has just checked in at Hosea Kutako International Airport, and an anxious Oiva cannot afford to miss this flight, which at this time is 30km away and separated by snail-paced traffic meandering into Klein Windhoek. Martino stays close to Windhoek in Okahandja, which is 60km away while Oiva arrived from Grootfontein, some 400km northeast of the Namibian capital. The tension can be felt in the car, as Oiva fidgets with his phone assumedly in contact with Martino. "I was meant to come yesterday but my mom was too emotional to let me go. I decided to hitch-hike early this morning," he explains. Oiva and Martino spent the last 12 months in China's Nanjing city learning Mandarin, after being awarded scholarships by Chec to undertake a five-year degree. Chec is an international Chinese state-owned company specializing in large-scale construction projects such as the building of harbours, railways, and bridges. The company has been awarded two major construction projects in Namibia, which are both part of the Port of Walvis Bay Expansion Programme. "Everything is paid for. Literally everything. Our job is just to show up and study. We cannot afford to let the country down by coming up with excuses for missing a flight or inconveniencing this great programme," he says as he helps his chauffeur navigate the vehicle out of Windhoek, with visible exasperation. It will be another six months before Oiva returns to Namibia - if he makes it to the airport in time. On September 12, Oiva turns 20. Raised by a single parent mother he hopes to make a difference not only to the nation, but to his family. "My mom is a teacher at Friedrich Awaseb Secondary School in Grootfontein, where I also studied. Two of my sisters are studying in the teaching profession. My other brother is still unemployed. Being the youngest, I need to rewrite my generation route," he says with an air of determination. Oiva was only 18 when Chec approached the Namibia University of Science and Technology for its top students and received a US$30,000 scholarship, which includes, tuition fees, accommodation, flights plus a monthly living allowance of US$300. He was still getting to know Windhoek, having enrolled for the Introduction to Science, Technology, Engineering and Mathematics (InSTEM) programme, one of Namibia's toughest engineering selection initiatives. "We were 200 during the first three months of InSTEM. I believe I was one of the brightest and when Chec came knocking we were around 100 students left in the selection programme. Currently, I am informed only 29 made it through," says Oiva. About 400km west of Windhoek, on the Atlantic shores of Walvis Bay, Xu Yuqing, the Chec deputy project manager for the Walvis Bay New Container Terminal and the National Oil Storage Facilities Project, is preparing to take a nap. He has just received word that Oiva is in time for the airport check-in. "They are young, they have not flown this much before, so it's understandable to have these slight glitches. Oiva actually passed with one of the highest scores in the Mandarin class, so we have high hopes on him," he says, as he prepares for his noontime nap. In the corridors of Chec offices in Walvis Bay, Chinese employees are reclining on their chairs, getting a moment of shut-eye; a few are squatting outside enjoying a smoke. "It restores our bodies' balance, ying-yang," says Xu, adding that it is good for productivity, "plus well rested workers are happy workers." Xu, like the two Namibian students also flies home twice a year. He was last there six months ago. At least he has the benefit of being a senior staffer. "Some of our guys go back to China only after two years. We are on duty when we are here. This was my first time outside China and I am grateful I was assigned to Namibia. The people are loving and eager to learn," Xu says. He was already in Namibia when China changed its one-child policy in early 2016 and needs to settle down fully back home before planning a family with his wife, who is resident in China. The port expansion of Walvis Bay is what mainly occupies him, as well as the oil storage facility, and both are on course for completion. It was in 2012 when Chec was awarded the US$260 million contract to expand the port of Walvis Bay on 40 hectares of reclaimed land. The project commenced in earnest in 2014 and the 2017 commissioning timeline was delayed due to the geotechnical conditions below the seabed at the project site and its effects, which were not foreseen and had to be analysed and addressed. China's gravitational pull can be felt across Walvis Bay. If it is not the Chec utility vehicles, then it is the staff buses, ferrying employees from the port to the Tank Farm or the Oil Terminal. If not that then its buses headed 30km to Swakopmund with Husab mine employees, between the Namib Desert and the Atlantic Ocean, where China's biggest investment in Namibia is based. There, Chinese state-owned company, China General Nuclear Power Corporation (CGNPC) and Namibian state-owned mining company, Epangelo have entered into a US$5 billion investment aimed at making Namibia the second largest uranium producer in the world, while contributing 5 percent to Namibia's GDP growth. But many Namibians are unaware of China's real contribution to Namibia's development. Chinese companies in Namibia are viewed by many as corrupt and benefiting from corrupt politicians for multi-million-dollar procurement deals. In March, Namibia's Supreme Court stopped Chinese company Anhui Foreign Economic Construction Group's planned US$477 million expansion of the Hosea Kutako International Airport, declaring the contract awarding process unlawful, hence null and void. In modern times, a natural aversion has existed among young Namibian graduates towards the Chinese, while political veterans have an affinity with China, based on the days of Namibia's liberation struggle. That moral solidarity is not shared by the new crop of voters in Namibia, many of whom were born around 1990 when the tiny African nation of 2.4 million became independent. That moral and historical solidarity underpinned both countries' decision to extend diplomatic, financial, and material partnerships aimed at benefitting Namibia's growth, an idea not shared by the young Namibians, who want a piece of the cake. Chinese investments in Namibia now exceeds US$5 billion. China and Namibia signed a Reciprocal Investment and Protection Agreement in August 2005, paving the way for Chinese firms to enter the local market. Today, Namibia is home to 40 Chinese companies generating about US$5 billion in revenue per year, employing some estimated 8,000 Namibians. It is still disputable how many Chinese nationals are in Namibia, but as of 21 February, according to Home Affairs and Immigration Minister Pendukeni Ivula-Ithana the Namibian government had issued 1,350 permanent residence permits, close to 5,000 work permits and 1,100 temporary residence permits to Chinese nationals. "After independence, China and Namibia have built on this strong foundation and continue to elaborate wide-ranging cooperation in many sectors. The China-Namibia relationship is indeed unique and special. Namibia is home to the only space tracking station of China in Africa, playing a vital role in China's space programs," notes Dr Elia Kaiyambo, Namibia's ambassador to China. Chinese President Xi Jinping has put up a US$1.6 trillion budget plan over the coming decade into Chinese infrastructure development throughout Asia, Africa, and the Middle East, exceeding any other world leader's plan for Africa. "I can give you an example. When our Prime Minister Li Keqiang visited Kenya, he suggested that China collaborate with other African countries and set up railway lines to connect each other's capitals. "Can you imagine Windhoek connecting with Dar es Salaam and Johannesburg by rail? It's a very beautiful picture. We can work together to realise such a dream," says outgoing Chinese Ambassador to Namibia, Xin Shunkang. That will only work if the rest of the country and the continent embraces the Chinese in the way the town of Walvis Bay considers the Chinese as family. Chinese works through Chec are there for all to see, says Erongo Regional Governor Cleophas Mutjavikua. Besides a nightclub solely dedicated to the Chinese nationals and frequented by most locals, the town has opened up to its visitors and the relationship is symbiotic. "It was not easy at first, but I believe we had to earn the trust with our works. What we have done in such a short space of time, no other company could have achieved," says Xu. This wind-swept town now boasts an artificial peninsula the size of 40 football fields as part of its vast port expansion, offering a glimpse of southern Africa's best-kept secret: Namibia. The completion of the US$400 million national oil storage terminal is in sight too. "As far as I am concerned, we are well on track for scheduled completion with both our projects. It's just that many things you see, many things you don't," says Xu, as we inspect the 75,000m3 Oil Tank farm, which is part of the oil terminal. The port expansion activities in the Port of Walvis Bay are divided into two projects, both of which are at various stages of implementation. The Port of Walvis Bay new container terminal on the reclaimed land project, being implemented by Namport. The Port of Walvis Bay North Port programme, of which phase 1 is the new liquid bulk terminal currently under construction, is being implemented by the Ministry of Mines and Energy. The trestle-work for the Tank Farm is completed, and Xu says within two years both projects will be fully operational and complementing each other. The liquid bulk terminal will increase Namibia's oil storage capacity from the current 15 days to 45 days. And it is a sizeable lot, with seven oil tanks and one water tank all sitting on 20,000m3, 10,000m3, 5,000m3 and 7,000m3, respectively; each beam two meters long with 11 bars. "This is the part of the projects where we do not allow locals. The Tank Farm is an issue of national security and requires a high-level set of skill and experience to manage. Even our teams are highly trained and vetted before working here. It is a new phenomenon for Namibia, so it is understandable when we cannot find such skills. "In fact, much of the work on these projects are new, the small reason we have sent those two young students to study such skills," thus Xu. Chec tells the true story of Chinese success in Namibia. With the Namport project, Chec is more than doubling its cargo handling capacity. Namibia is actively promoting the Port of Walvis Bay as a gateway into Southern Africa. Besides Oiva and Martino, who are destined to return in 2020and automatically be employed to maintain the port in four years, a year after its commissioning, Namibia has also supervised the training of 20 Namibian graduate civil engineers during the project. Namport statistics show on the job training of over 700 previously disadvantaged Namibian employees by Chec, where close to 500 received full training in areas, such as plumbing, piling, marine work, steel fixing, and riggers. Port engineer Elzevir Gelderbloem says: "With the new container terminal project, the biggest lesson we have learned is how to get a megaproject like this off the ground, that is from conceptual stage to implementation stage. Once implementation started the difficult part was over. Getting government buy-in for these large projects is crucial at the beginning of the project, without which such a project we would have simply failed. We also learned many lessons in terms of how to do procurement on such a large project. In the end, our procurement was guided by the big development finance institutions (DFIs) and their standard templates... "
Once the new container terminal is completed, the Port of Walvis Bay's cargo handling capacity will be increased by a factor of two in all respects. This increased capacity will not just be for containerized cargo but also for non-containerised cargo. While the new container terminal will initially focus on acting as a transshipment hub in the region, with an increased capacity for cargo throughput the Port of Walvis Bay will be setup to easily handle more cargo that originates or is destined for landlocked countries in Southern Africa. The port will also be in a position to truly serve as a gateway into SADC and as a logistics hub for this purpose. With increased cargo movement to and from SADC countries comes infrastructure and economic development along the transport corridors, which in turn brings employment and growth. According to Gelderbloem, as of July, the new container terminal's progress in terms of construction time was at 64%. Dredging and reclamation are so to say completed at 97%; what is now ongoing is mostly civil and building works. These will all be completed by end of 2018, after which testing and commissioning will start. For the port engineer, the current success has not been without misconceptions, primarily around technical difficulties experienced with the quay wall construction in 2016. He says, "We released a press statement in 2016 on the problem, and that problem was in fact solved by July 2016 already. However, this old issue was again published in mid-2017 as if it were a new issue, which we were still struggling with, which it was not. The facts in the new publications were also incorrect. We have not had any problems on the site since the piling issue of July 2016, where the contractor had to change his piling methodology to avoid piling difficulties, which were caused by a layer of diatomaceous silt 30 to 60m below the seabed. "A misconception was also that we were not aware of the diatomaceous silt below our seabed. This cannot be further from the truth since we have numerous technical reports from geotechnical investigations dating back many decades in which our underlying geology in Walvis Bay is well documented. The fact is that this location we chose for the reclamation is the best location in the bay area in terms of underlying geology, but as with any complex project there were technical difficulties, which were solved." Generally, the period of time from conceptualisation to start of implementation was the most difficult and cumbersome. The project was started in 2005, but NamPort only started implementation almost a decade later in 2014. "The procurement of the biggest contract (the EPC contract) was the toughest part of the entire project. Due to Namibia being such a small country in terms of population, procurement of such large contracts attracts a lot of scrutiny from the public. The evaluation of such large tenders is in itself a huge undertaking. When the EPC tender was finally awarded in 2013 the most difficult part of the project was done," he says. The benefits that the project brought during construction alone can be seen in the target for local content in terms of money spent in Namibia by the EPC contractor, which was 31% of US$260 million, i.e. US$80 million spent on Namibian suppliers and contractors. It is a matter of time before Oiva returns to maintain the new container terminal that now has an added 600m of quay length to the already existing 1,500m and 650,000 twenty-foot equivalent units capacity, which provides more space for bigger cargo vessels. "We want to provide capacity ahead of demand and ensure Namibia maintains a competitive edge in southern Africa," says Namport CEO Bisey Uirab, who is determined to make Walvis Bay Port the preferred port on the African west coast and a logistics corridor for southern and central African operations. Already Botswana, Zambia, and Zimbabwe consider Walvis Bay Port the nearest and fastest trade gateway to global markets, especially Europe, China and South America. Namport is expected to handle more copper from Zambia and the Democratic Republic of the Congo "and the two markets have responded positively". The two countries are among the top 10 copper producers in the world. The new container terminal will be well equipped to handle anticipated increases in cargo volumes. "As of June 2016, four super-post Panamax ship-to-shore quay cranes were under construction in Shanghai, China," Uirab said. According to Gelderbloem, the national oil storage terminal is but one phase of the huge North Port programme. This first phase consists of the construction of two new jetties, each capable of accommodating a 60,000 DWT tanker with the associated supporting infrastructure to convey the refined oil products to the new Tank Farm. He says the North Port sits on 1,330 hectares of land, and five times that much in the water area, whereas the existing South Port only has access to 150 hectares of land, which includes the newly reclaimed 40 hectares. Subsequent phases of the North Port programme include terminals for handling LNG, LPG, dry bulk, ship repair yards, multi-purpose terminals and much more, all to cater for port capacity demand over the next 50 to 100 years. "You tell me with all those giant projects, the Chinese president (Xi Jinping) will not come to Namibia to commission them? He will definitely come. This is as big as they come. I know the Founding Father Dr Sam Nujoma will be there, and other presidents, like Robert Mugabe, [and] the one from Zambia. "So, when the tough gets going for me in my class or when I miss home a bit, I just think of the day I will meet President Xi. That man is already big in China. Jack Ma was already in Namibia, I was told Sam Nujoma recently toured the new port developments. Now imagine being photographed with Jack Ma, Sam Nujoma, Xi Jinping in Walvis Bay at the commissioning of this port? "I keep dreaming about it. I am waiting for Xi and I am studying for Sam Nujoma and my country," says Oiva, who has never been to Walvis Bay himself. * This report by Confidence Musariri was produced with aid of a grant provided by the Africa-China Reporting Project managed by the Journalism Department of the University of the Witwatersrand.